The Hillsboro softball team achieved a come-from-behind upset win over No. 1 seed Marion in the semi­finals, but couldn’t avoid a 3-0 shutout by No. 2 seed Chase County in the championship game of the Class 2-1A regional tournament in Galva, May 14-15. The Trojans, who came into the tournament as the No. 4 seed with a 10-10 record, escaped Monday’s opening round with a 12-2 win over the host school, No. 5 seed Canton-Galva, to advance to Tuesday’s competition. The Trojan team that scored nine runs and knocked out 12 hits in their semifinal upset of Marion earlier in the afternoon seemed all but drained at the plate with a state playoff berth on the line. 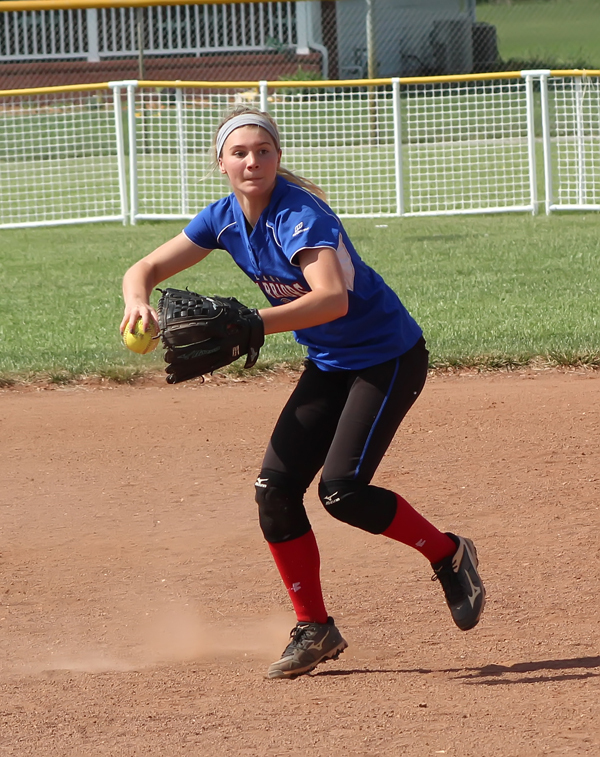 Chase County pitcher Audrey Tubach dominated the Trojans, allowing only one hit—a Sarah Jost single in the sixth inning—on the way to a title-winning shut­out performance. 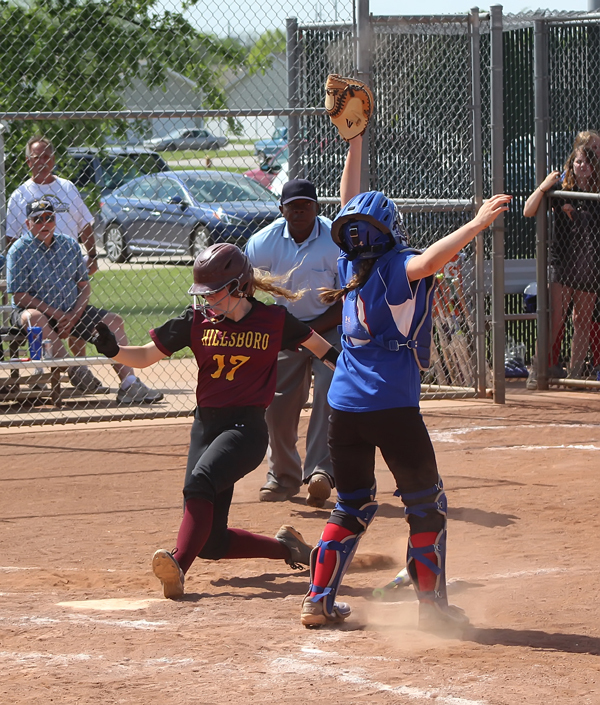 Hillsboro didn’t have a base runner until Tubach’s throwing error in the third inning—and the Trojans didn’t get another runner until Jost smacked her single in the sixth. Keeping Hillsboro in contention was the pitching of Helmer, who shut out the Bulldogs through the first three innings. In the fourth inning, Hillsboro’s generosity on defense—two fielding errors—led to Chase County’s first run. After Brylee Potter reached first on a miscue at third, Kinsey Reyer delivered an infield single. Tubach then lifted a fly ball to center field. The ball popped out of the fielder’s mitt, scoring Potter. Though additional runs weren’t required, the Bull­dogs added one run in the fifth and sixth innings to secure the regional title and a state tournament berth. Helmer nearly capped her Trojan softball career with an over-the-fence home run in the last inning. But Chase County’s Potter made an outstanding catch, crashing into the flexible outfield fence for the second out of the inning. Coach Stephanie Sinclair said this season had its ups and downs. “The girls played through some struggles this season,” she said. “Not everyone was always 100 percent physically or emotionally healthy, but we pulled it together. As individuals we appear average, but together these girls made a strong team unit. I am very proud of them. With the end of the season, Sinclair will also end her 13-year tenure as head softball coach at Hillsboro. The Marion Warriors, the top seed with a 13-8 record, started the game like a favorite should, scoring three runs in the first inning and two more in the second for a 5-0 advantage over the Trojans. Hillsboro contributed to Marion’s first-inning burst with three fielding errors. Lead-off hitter Kourt­ney Hansen benefited from one fielding miscue, then advanced on a single by Corrina Crabb. A dropped fly ball in deep right field off the bat of Chisholm Waner enabled Hansen to score. Laura Savage then cashed in on a Hillsboro error at first base. One final Trojan error off the bat of Lindsey Sigel enabled Waner and Savage to score for the 3-0 lead. Marion upped the ante in its next at-bat—with help from two more Trojan errors. Savage managed the only Warrior base hit in the inning, enabling Hansen and Crabb to score for a 5-0 lead. Meanwhile, Hillsboro’s offense was minimal against the pitching of Marion ace Grace Overton. The sophomore allowed only two hits through the first four innings. Without warning, the dam burst for Hillsboro in the bottom of the fifth inning. Martin, Trinity Marler Bisbee and Elli Weisbeck knocked consecutive singles to get it going. A walk to Dani Klein forced in one run and a single by Sarah Jost drove in Bisbee. With the bases still loaded, Ave Weisbeck drilled a double to left field, clearing the bases. Weisbeck then scored on single by Helmer as Hillsboro suddenly vaulted to a 6-5 lead by the end of the fifth inning. To their credit, the Warriors didn’t let down. Tori Shults singled with one out in the bottom of the fifth. A strikeout later, Sigel walked. Molleker then delivered an RBI single to center to score Shults. Sigel scored on another HHS error to hand the lead back to Marion, 7-6. After a scoreless sixth inning, Sam Moss reached base on a Warrior throwing error to start the seventh. Helmer then chased Moss home with a double. Chey­enne Bernhardt then singled on a grounder down the third-base line. With runners at first and third, Martin knocked a ground-rule double, scoring both Helmer and Bernhardt and giving the Trojans the final 9-7 lead. Helmer nailed down the win with one final shutout inning in the bottom of the seventh. Four of Hillsboro’s 12 base hits were doubles, with Ava Weisbeck, Helmer, Martin and Elli Weisbeck contributing. Overton absorbed the loss with Waner coming in relief. Helmer surrendered only six hits in the game, to go with three strikeouts and one walk and one hit batter. “It was a heck of a season,” said Jennifer Felvus, who is completing her tenure as Warrior coach. “I just thanked them for a great season and for how much joy they’ve brought to my life and how much fun they’ve been. Felvus saluted her seniors: Alli Molleker, Bailey Baker, Kourtney Hansen and Lindsey Sigel. The Trojans came into the tournament with momen­­­­tum, having won six of their last seven games of the regular season. Hillsboro didn’t waste time against the Eagles, scoring three runs in their first at-bats. Dani Klein walked, Sarah Jost reached on an error and Ava Weisbeck singled to load the bases. A walk to Sam Moss forced in one run, and Taylor Helmer followed with a two-run double for a 3-0 lead with nobody out. Eagle pitcher Ashton Brewer got out of the inning without further damage. Hillsboro added a run in the third inning on an RBI single by Kylee Martin, scoring Helmer who led off with her second double of the game. When the Trojans scored two more runs in the fourth, one on a lead-off home run by Dani Klein and a second run on a walk to Ava Weis­beck who scored with the help of two Eagle errors. Canton-Galva responded with two error-aided runs off of Helmer. Jayci Mastre and Alexa Burch crossed the plate to narrow the Trojan lead to 6-2. But a six-run fifth inning for the Trojans, fueled by three Eagle errors, ended the game by run rule after Helmer retired the final five Canton-Galva batters without surrendering a base hit. In addition to her three-hit pitching, Helmer led the offense as well three hits in four at-bats, scoring twice and driving in two runs. Brewer absorbed the pitching loss for Canton-Galva. Koehn, Taryn Nord­strom and Carissa Klatt each contribute a base hit for the Eagles, who finished the season with a 7-12 record under head coach Dean Scott.